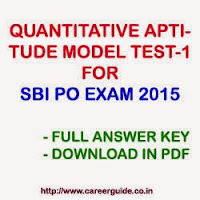 Here is solved questions of quantitative aptitude for SBI PO and IBPS exams. quantitative aptitude and numerical ability questions are asked in almost all examinations and candidates need to practice this section very hard to score good marls and hence good position in merit list. You can also download this question paper in PDF to save it for future references or take print out. Q.1. Three fourth of a number is equal to 60% of another number. What is the difference between the numbers? So x and y could have multiple values and hence we cannot determine there difference. Q.2. Abhijit invested in three schemes A, B and C the amounts in the ratio of 2:3:4 respectively. If the schemes offered interest @20 p.c.p.a. 16 p.c.p.a and 15 p.c.p.a respectively, what will be the respective ratio of the amounts after one year? Let A, B, C be 200, 300 and 400. = 60 : 87 : 115. Q.3. A train crosses a 300 meter long platform in 38 seconds while it crosses a signal pole in 18 seconds. What is the speed of the train in km/h? Let the length of train is L meters. = (15 * 3600)/ 1000 = 54 km / hr. Q.4. If 2x + 5y = 109 and 2x + 5 = y + 12 then y - x = ? x = 12, y = 17. Q.5. Four of the following five parts numbered (1), (2), (3), (4) and (5) are exactly equal. The number of the part, which is not equal to the other four parts, is your answer. Value of all except (3) is 600. Q.6. Certain number of pieces of an article are to be packed in boxed, such that each box contains 145 pieces. If after packing them in 32 boxed 25 pieces are left out, what was the number of pieces to be packed? Number of pieces are 145 * 32 + 25 = 4665. Q.7. Which of the following set of fractions is in ascending order? Q.8. 3 Girls and 4 boys are to be seated in a row on 7 chairs in such a way that all the three girls always sit together. In how many different ways can it be done? Since three girls always sit together so we can consider them as single unit. So number of ways to arrange 4 boys and 1 unit of girl is 5!. Now we can arrange girls in 3! ways so ans is 5! x 3! = 720. Q.9. In how many different ways can the letters of the word DRASTIC be arranged in such a way that the vowels always come together? As there are 5 consonants and 2 vowels, so number of ways to arrange them so that vowels always come together is 6! x 2! = 1440 . (First we will take vowels as single unit and then arrange them mutually). Q.10. Area of circle is equal to the area of a rectangle having perimeter of 50 cms, and length more than the breadth by 3 cms. What is the diameter of the circle? Let the length be x cms so breadth is (x-3). => 50 = 2(x + x - 3) => length = x = 14, breadth = x - 3 = 11. => r = 7 cms, Diameter = 2 * r = 14 cms.